What is Mother Roasting and Why Does it Matter? I love connecting with other people who work in the birthy world. I met Claire aka @thelondonacupuncturist over coffee a few weeks ago and talked all things postnatal self-care, mothermoons and mother roasting. What's mother roasting you ask? Claire's written a guest blog to share what it's all about and why you should treat yourself to this lovely postnatal ritual which I'm so excited about. As an acupuncturist specializing in fertility and pregnancy I have worked with A LOT of women over the years, and one thing I know to be true – once the baby arrives, the self-care tends to stop. At least for a while. So when I was introduced to Sarah and found out more about her Mothermoon initiative I was extremely pleased to meet a kindred spirit. 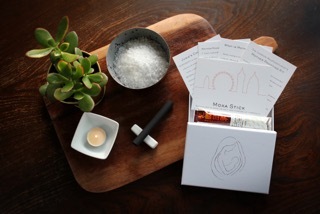 I had just launched my Mother Roasting Kit as a way to give new mums a practical tool to aid their recovery post birth, something that could easily be done at home. In Chinese Medicine, mother roasting is a traditional treatment to promote recovery after giving birth, closing the gateways that have been opened, repelling wind and cold from the uterus and preserving the health of the mother. This is said to address the depletion post-birth that Chinese medicine believes can be a factor in low milk supply, post-partum depression, prolapse, fatigue, insomnia and anxiety. All of which sounds like a no brainer to do, right? But as it is most effective if done within a week of giving birth it falls off the list of ‘things I need to get out of the house for’, so I decided to create a gift box with everything you need to so it yourself at home. Deeply nourishing, relaxing, quick and easy to do, a moxa stick is used to warm the abdomen (and the lower back if a support person is available to help with that area) for five to ten minutes to tonify the Qi in that area post birth. Helping the uterus to contract and replenishing the blood and Qi it’s a post partum power up. But there’s another part of the mother roasting treatment that makes this so important; the honouring of the experience you have just had in giving birth. Mother roasting nourishes the mother you now are, so that you can nourish the child you have. It offers a way to reconnect your heart and mind with your body. It can be a lovely, intimate thing to do with your partner, creating a space to acknowledge the experience you have shared and to honour the body that has just brought a new life into the world. Every birth is different. Getting to know the new being in your life can be overwhelming at times. The change in hormones and your body might be challenging. As well as a practical way to help physically recover from pregnancy and birth, mother roasting is a tool to help you navigate that fourth trimester, to process the birth and adjust to the new status quo. So no matter how little time you might think you have for self-care when a tiny helpless new being seems to need so much care, taking ten minutes out for mother roasting is definitely something you can do. Head to Claire's website to order your own Mother Roasting Kit!